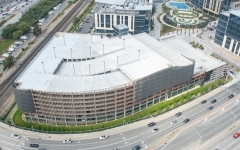 The new 678,000 SF, nine-level parking garage serves the Oyster Point development which caters to the life sciences and technology related industries. 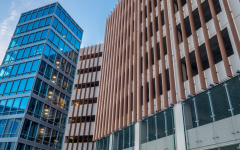 The campus includes 884,000 SF of office space across seven buildings and 20,000 SF of retail space at the ground level of the parking structure, as well as restaurants and a hotel. Also included are green spaces, sports/fitness facilities, and an outdoor amphitheater. The development is being constructed in three phases and is nearing completion of the final phase. 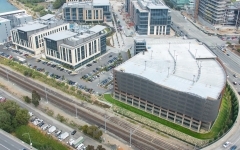 The parking structure follows the existing curvature of Oyster Point Boulevard and Highway 101 in South San Francisco. The exterior façade is treated with an articulating scrim of perforated metal and clad elsewhere with vertical precast fins to help conceal the interior of the structure. The base to the parking structure also has a two-level green-screen application to help soften the edge at the ground level. The retail elevations are decorated in a stone-cladding and metal-panel system in a style similar to the adjacent newly constructed office buildings. 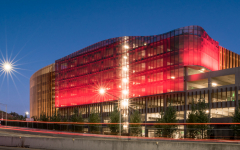 At night, the exterior is illuminated with programmable LED lighting that creates drama and interest for this highly visible façade. Vertical circulation is accomplished via a four-cab elevator bank housed in a transparent glass tower.